For New Yorkers and tourists alike, free Shakespeare in the Park is a summer must-see in New York City. Did I mention it is free? And of course, the "Park" is Central Park. Specifically, the beautiful Delacorte Theatre located right in the middle of it. 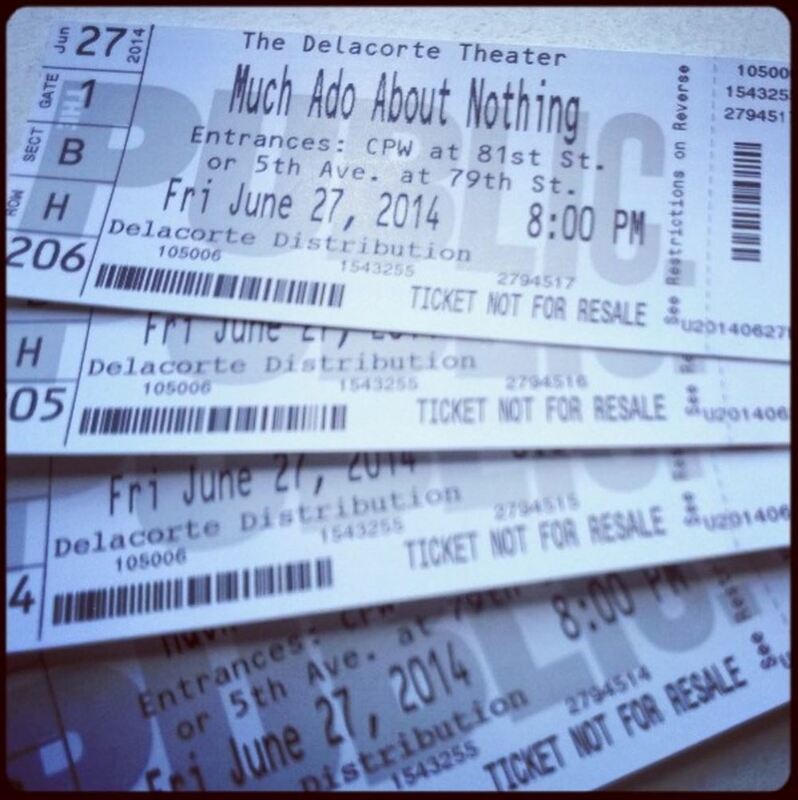 Each summer, the Public Theater stages productions of one Shakespeare comedy and one tragedy. We have always opted for the comedies - although honestly, it seems the tragedies usually have bigger-name stars. You may have heard of a few of the actors from recent productions - John Lithgow, Sam Waterston, Amy Adams, Al Pacino, Live Schreiber, Meryl Streep, Kevin Kline, Denzel Washington, Christopher Walken, etc. etc. etc. There are several ways to get tickets. They are free, but getting them takes a bit of effort - which is totally worth it in my book. The most popular way is to line up for free tickets. This is definitely a "thing" to do in New York. You have to do this at least once, just to experience it. If you live here, you'll see how nice your neighbors can be. If you are visiting, this experience will show you just how super-nice New Yorkers actually are. Most days, people start lining up on the sidewalk by the theater by 5 a.m. The bigger the stars - the longer the lines. They bring folding chairs, blankets, books, games, etc. It is a pretty civilized experience. Volunteers from the theater keep everyone on line in line with a bit of humor, info about the shows - and a reminder that everyone has to play by the rules (two tickets per person, no selling the tickets, etc.) People order breakfast from Seamless from nearby delis on their mobile phones. Delivery guys constantly bike in and out of the park with people's orders for coffee and bagels. Tickets are handed out at noon for that day's performance only. If you miss out, you have to come back another day and try it all over again. They also have a mobile lottery for a limited number of tickets, and distribute a limited number of tickets for select performances at locations around the city. Here's an overview of all of the options. We have camped out for tickets (it really is fun! ), but the last two years we have "cheated" and reserved our "free" seats several months in advance by becoming Summer Supporters of the Public Theater. Last year, as it turned out, we unknowingly picked the perfect year to join. Not only did we get our Shakespeare tickets without line-sitting, but since "Hamilton" originated at the Public Theater - we got first shot at buying tickets when it moved to Broadway before they went on sale to the public. (We didn't save any money on them, but we did get to see it fairly early in the run). For me, getting the tickets in hand is just the first step. Then it's on to Wikipedia to read and re-read a synopsis of the play. Without it, I'd be lost trying to watch Shakespeare. New Yorkers - what are the other "must do" things to do during the summer in the city? A year ago, if you'd told me that my favorite Broadway musical would turn out to be a hip-hop flashback to junior high history, I'd have thought you were crazy. Three hours of song and dance about our nation's Founding Fathers? Not really my idea of a night on the town. Well, fortunately, someone else (that someone else being Lin-Manuel Miranda), had other ideas - and the musical "Hamilton" was born. A quick bit of background: Based on a biography of Alexander Hamilton, the show opened off-Broadway at New York City's Public Theater last year. It quickly generated a lot of buzz, attracting celebrities, politicians and media. The show uses hip-hop music and a multi-ethnic cast to tell the story of Hamilton, previously known to junior high students as the guy who was killed in a duel with Aaron Burr. Scott and I both love going to shows, but despite Broadway being just a few subway stops away, we don't go as often as we'd like since work and life kind of get in the way. But we figured there had to be something to all the buzz. So we bought tickets last spring - three months before the show even opened on Broadway, and seven months in advance of our performance. Well, it didn't just live up to the hype - it far exceeded our expectations. Even though on the day of the show, I had been up since 3 a.m. for an appearance on "FOX & Friends," I was on the edge of my seat. We were blown away by the genius music and storytelling (portraying Jefferson and Hamilton's Cabinet debates as rap battles, or King George III's warning to revolutionary colonists styled as a hilarious Brit-pop break-up song). But here's the bad news: don't plan on seeing the show if you're coming to New York anytime soon. Checking Ticketmaster today (which is the only place I would recommend buying tickets, as there are more counterfeit "Hamilton" tickets floating around than there are fake Louis Vuitton bags or "Bolex" watches on Canal Street), there are a few random single seats available next winter - as in December 2016 and January 2017. If you want tickets, follow the show and watch when the next block of tickets goes on sale - and snap them up as soon as they do. There is a daily "lottery" where a few lucky people win the opportunity to buy last-minute front-row seats for $10, but because you're competing with about a zillion people, the odds of winning aren't good. The show also starts an open-ended run in Chicago this September, so you can follow the show to find out when tickets go on sale. Other extended runs are planned for L.A. and San Francisco, but I haven't yet seen any details about those. Until then, you can get your "Hamilton" fix by listening to the fantastic cast album, catching them opening the live Grammy telecast on February 15, or - better yet - reading the biography that tells the story of this colorful "ten-dollar Founding Father." If you ever get your shot at seeing "Hamilton," you won't be disappointed. Already seen it? What did you think?